Remember that time, last week, when I was all excited about my birthday? How we were going to go eat pie! and see magic! and bask in the glow of my 24th year of life? Remember that? Me too. That was the day before my birthday. Let me tell you about my actual birthday. For starters, it was the hottest day in Baltimore for 27 years. Only TWO DEGREES away from the hottest temperature ever! Actually, that is the starter, the middle, and the ender. It was so hot that eating dinner in a restaurant that had it’s ovens on (and questionable ac) was painful. And the bar? The magic bar where they do MAGIC? Closed. Because it was so hot that the city was losing power. The end result was us showering and laying very still next to our ac window unit. And Dan feeling awful that his (amazing) plans got blown by an insane heat wave (one that, if put into the context of Baltimore’s record snow storm, makes the global climate crisis seem a little more real. AM I RIGHT DAD?). In the context of last week’s extreme heat it seems a little silly (in retrospect) that I turned my oven on. In my tiny, unairconditioned apartment. With a kitchen that vents very poorly. And is as far away from the window unit as physically possible. Okay, so it was crazy to turn on my oven. But, BUT, it was so worth it. Because the end result was pie. Delicious, peachy, flaky crusted peach pie that made up for the heat, made up for my sweaty birthday, made up for the whole sticky mess. Behold, the power of pie. 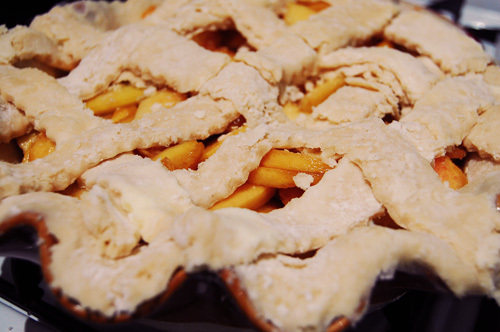 I’m going to assume a few things when I tell you to go forth and bake this pie. First, I’m going to assume that you have air conditioning, or at least live somewhere where turning on your oven is a possibility. If you don’t (but you’re dedicated to the idea of pie) make this at night right before taking a shower and going to bed. Cool, dark bed. 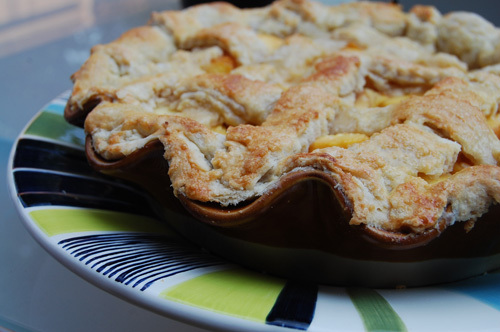 I’m also going to assume that you love peaches as much as I do, and that the idea of peach pie makes your mouth water. Finally, I’m going to assume that you’re just like me and that making (and eating) pie provides you with enough joy that it outweighs all the other crap. So eat pie! Look on the bright side of life! Peel and slice your peaches. The peaches should be sliced thinly. 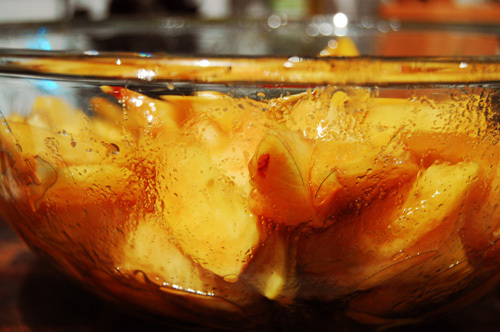 Combine in a bowl with brown sugar, lemon juice, flour, and corn starch. Mix thoroughly. Heat oven to 375. Roll out your bottom pie dough and place in pan. Scoop in filling. 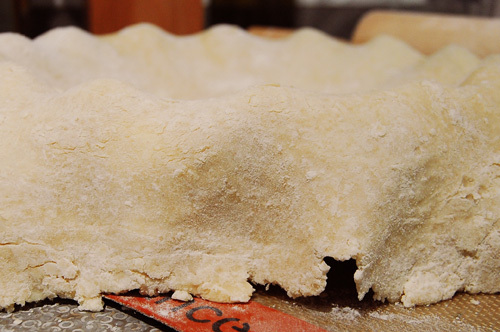 Roll your top pie dough out and, using a knife or a pastry knife, cut into strips. Overlap the strips in a lattice pattern. Whisk egg, and brush egg over the top of the pie. Sprinkle with sugar. Elena, that pie looks like it was worth every one of those 375 degrees. I don’t think I could survive here in the south without my air conditioner. I just… I don’t even want to think about it, haha. This pie recipe looks amazing! Sorry your birthday plans got a little messed up, but you have pie to console you. That pie certainly has my mouth watering! I’m in Annapolis and it is beyond hot!! 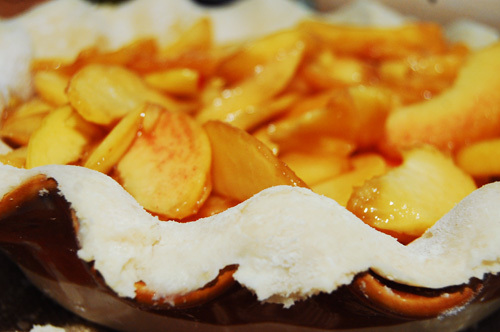 I need to make a peach pie. Peaches are at their zenith right now. Had one today at lunch in my cubicle. It was a quite a messy operation. Peach juice everywhere. A piece of pie would have been more civilized, I think.